With the temperature heating up, it’s evident Summer is approaching! 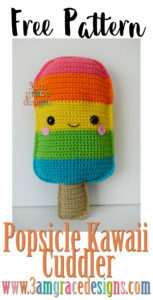 The first design in our Summer Series Kawaii Cuddlers is the Popsicle! She is adorable with a rainbow stripe, but would also be cute with variegated yarn or a red-white-blue bomb pop option! Below you will find instructions to make your very own Popsicle! Enjoy! * Place safety eyes between rows 27 & 28 from the top of the popsicle body, roughly eleven stitches apart. * Sew or glue cheeks & bow in place. * Use puff paint or embroidery thread to create desired mouth. * Align popsicle halves so ends of rows match. With wrong sides facing each other, single crochet around both pieces to join together. If you’ve created a popsicle with multiple colors and want your edging to match – make sure you change colors as you SC around.